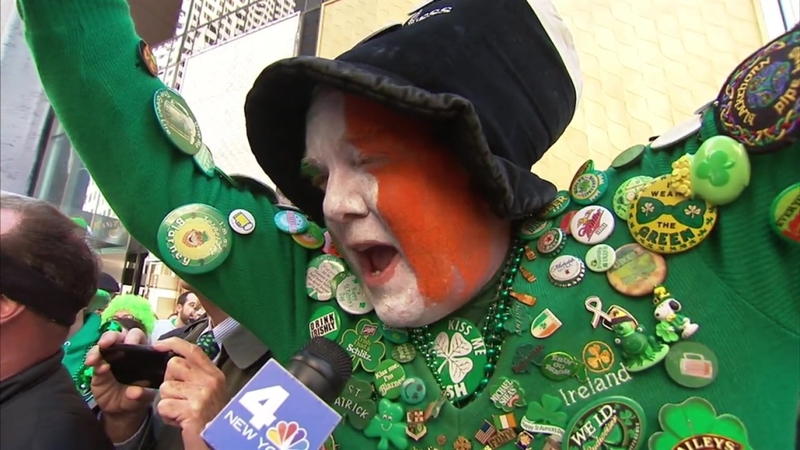 Hundreds of thousands of revelers and marchers decked out in shamrocks and all shades of green crowded onto Manhattan's Fifth Avenue Thursday to celebrate the 255th New York City St. Patrick's Day parade. Security was tight as 200,000 marchers strode up Fifth Avenue beginning at about 11 a.m., bagpipes and horns blaring. This year's St. Patrick's Day parade -- the world's oldest and largest -- also proved to be a historic one, as openly gay and lesbian groups were allowed to march in the parade, ending a quarter-century long ban. "I never thought I'd see the day when I could march up Fifth Avenue in the St. Patrick's Day Parade with my husband," said Brendan Fay, chairman of the Lavender and Green Alliance, as the parade began. "When we started in 1991, after getting arrested so many times for protesting the parade, wow, what a moment this is." For years, organizers said gay people could participate but couldn't carry signs or buttons celebrating their sexual identities. Organizers said they didn't want to divert focus from honoring Irish heritage. Mayor de Blasio marched with the Lavender and Green Alliance, marking the first time he had participated in the festivities as mayor. He boycotted the parade his first two years in office because the march excluded gay and lesbian advocacy groups. "Today everyone is celebrating together," de Blasio said. "The city is at peace and unified." Parade organizers opened a door to gay groups last year, allowing a contingent from parade sponsor NBCUniversal, of which NBC 4 New York is a subsidiary. Gov. Cuomo and the entire New York City Council also joined in the parade and were watched by more than 2 million spectators who lined Fifth Avenue from St. Patrick's Cathedral in Midtown to the 79th Street Transverse in Central Park. The crowd included spectators from all corners of the globe. Spectators from Scotland, Venezuela, Australia and -- of course -- Ireland, made the trip to see the massive procession. "I'm proud to be Irish and the job they've done here in New York," said Irish tourist Jennifer Fox. The global appeal didn't stop there: the parade was also being broadcast live in Ireland and the United Kingdom via the Irish TV television channel in another first.